That’s right, to celebrate Journalist Without A Beat turning 2 years old on June 10th, I’ve partnered up with React Presents once again to award my loyal readers and supporters with ONE pair (2 Tickets) of 3-Day GA tickets to the 2017 Spring Awakening Music Festival! And finally, Tweet me why you want to experience Spring Awakening, using the hashtag #WINSAMFTIX. The winner and best answer will be chosen on Thursday, June 1st – Good Luck! 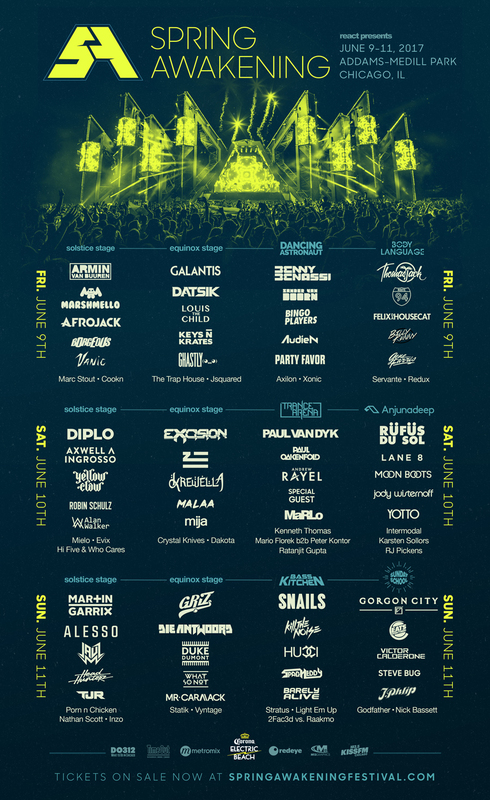 The Spring Awakening Music Festival hits Addams/Medill Park in Chicago on June 9th-11th. Must be 17+ to enter. Contest ends June 1st. Winner of contest will receive (1) pair of tickets/wristbands to the Spring Awakening Music Festival on June 9th-11th. Tickets are not transferable and will need to be picked up by the winner with their photo I.D. in order to claim their tickets. Winner will be notified on the day contest ends. If said person doesn’t respond in a reasonable time, a new winner will be chosen.